Island residents in the photo are Kim Kernin and Kim Schopp. Niagara Region PTA representatives who attended 110th New York State PTA Annual Convention are also shown. 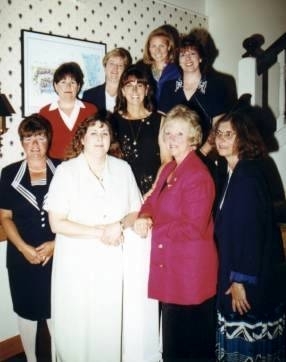 Island Representatives attending the convention, and not shown were Fran Seaman, Mary Kulak, Sue Colao, Trace Kozlowski, Kate Donahue and Maureen Lewis. Several Grand Island PTA delegates attended the New York State PTA's 110th Annual Convention held at the Rochester Riverside Convention Center in Rochester, New York, November 10-12, 2006 where 600 PTA delegates from around the state participated by voting, adopting resolutions and attending training and workshops. On hand to address the delegates was National PTA President Anna Weselak, as well as the mayor of Rochester, Bob Duffy. Delegates also had the opportunity to hear presentations from Timothy J. Magner from the U.S. Department of Education and Dr. Joel Fuhrman, a noted expert on nutritional medicine. Delegates were also treated to performances by talented musicians and singers from the East and West Irondequoit School Districts. 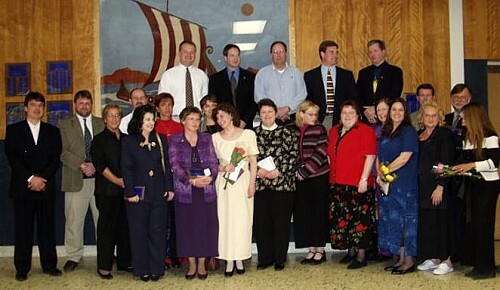 The Celebration of Inspiration, in its 14th year of teacher appreciation, was presented by the PTA Council on Wednesday, April 26, 2006 at Grand Island High School. High School seniors spoke of how the special teacher they chose, inspired them, encouraged them, believed in them or perhaps taught them something they'll always take with them. Grand Island High School PTSA will hold its next meeting at 6:30 p.m. Wednesday, May 10, 2006 in the Grand Island High School Library. A school budget presentation will follow the meeting. Grand Island High School PTSA will hold its next meeting at 6:30 p.m. Wednesday, March 8, 2006 in the Grand Island High School Library. Voting on new officers for the 2006-07 school year will take place. Memberships are still available at $5 each. The Internet, while a highly useful tool for connecting us to the world, can also be a source of unimaginable danger for youngsters, adolescents and teens. Did you know that many youth are posting personal information, including their photos and in some cases, contact information, on the web? Are you aware that pedophiles often disguise themselves as young people to make contact with kids who use chat rooms or create personal web sites? Realizing the importance of this issue, the PTA is sponsoring this special event with FBI Special Agent Holly Hubert. Ms. Hubert is a dynamic speaker and PTA representatives are grateful to have her discuss this very important topic. The presentation is open to all parents and others interested in the issue of Internet Safety. There is no charge and all parents, teachers and members of the community are encouraged to attend. Grand Island High School PTSA will hold its next meeting at 6:30 p.m. Wednesday, January 18, 2006 in the Grand Island High School Library. Memberships are on sale for $5 and include a free GI PTSA pen. Free refreshments will be available. 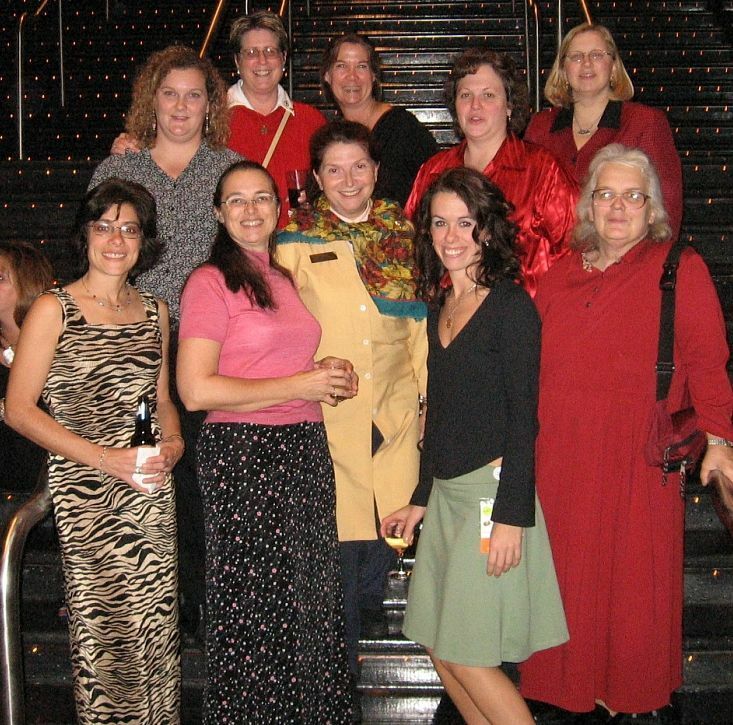 Tracy Kozlowski, Vicki Harnden, Ann Giancola, Kim Kernin, Amy Garten and Kathy Belter. 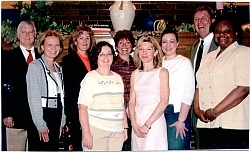 Twelve representatives of the Grand Island School District PTA (listed above) served as delegates to the 109th Annual NYS PTA Convention November 11-13, 2005 hosted in Buffalo and held at the Adam's Mark Hotel and Banquet Center. NYS PTA voting members from all over the state of New York came to vote on proposed resolutions for 2005-2006 year and attend workshops on Friday afternoon and on Sunday. Voting took place on Saturday along with a members banquet. There were also 150 exhibitors in attendance displaying their products and/or programs to the members. For more information on the New York State PTA and the convention, click http://www.nyspta.org or contact your local school PTA president. Grand Island High School PTSA will hold its next meeting at 6:30 p.m. Wednesday, October 12, 2005 in the Grand Island High School Library. The meeting will start with a presentation by Officer Chris Pyc, our School Resource Officer. Then the general meeting will begin. Memberships are on sale for $5.00 each with a free GI PTSA pen. Free refreshments will be available. Connor Middle School PTA will hold the first of three meetings at 6:30 p.m. Thurday, October 13, 2005 in the Connor MS Library. This is a geat opportunity to join and become involved. There will be a presentation and vote on the 2005-06 budget. Those interested in attending the NYS PTA convention in Buffalo are asked to contact PTA President Phil Valore, 773-2944 prior to October 10, 2005. "Please join us for the meeting." Grand Island School District PTA announces the following officers for the 2005-2006 school year. Grand Island PTA Council Officers are Vicki Harnden (Vice President), Fran Vitello Seaman (President), Kathy Chadwick (Rec. Secretary), Sue Campbell (Corr. Secretary). Not pictured: Heather Figler (Treasurer). Grand Island High School PTA officers are (front left) Dr. James Dempsey (Principal), Terry Endres (President), William Miller (Vice Principal); (back) Donnette Rayhill (2nd VP), Sue Campbell (Council Delegate), Maureen Lewis (1st VP). Not pictured: Patty Meyer (Rec. Secretary), Catie Lewis (Corr. Secretary), Kathi Hanaka (Council Delegate). Kaegebein Elementary School PTA officers are: (front) Mike Stark (2nd VP), Katalin Posch (Council Delegate), Lisa Missert (President), Kim Schopp (Rec. Secretary), Annalea Masiello (Corr. Secretary); (back) Patty Shaw (Treasurer), Maureen Gambino (1st VP), John Wiertel (Principal), Kim Kernin (2nd VP), Vicki Harnden (1st VP). Not pictured: Heather Figler (Council Delegate). Grand Island High School PTSA will hold a meeting on Wednesday, September 14 at 6:30 p.m. in the High School Library. Memberships are for sale for $5.00 with a free GIHS pen as an incentive gift. Parents and students are invited to attend. Free refreshments available. Candidates for school trustee answered more than 25 questions posed by audience members at Monday�s School Board Candidates Night, sponsored by PTA Council, the Chamber of Commerce and Niagara Frontier Publications. Myrna Blair, Brian Flynn, and Richard Little were generally in agreement on most topics, including the 2005-06 budget, which they support. Blair, an accountant, noted that her previous experience as a trustee would be an asset, that she would be a representative for the Island�s senior citizens, and that there would be another woman on the board for better balance. Flynn said that as a high school teacher of eight years he could bring a different insight and perspective to the board, and Little felt that his experience as project manager with an architectural firm would provide an important contribution to the district. Questions ranged from philosophical to practical, from academic to financial, focusing mostly on the latter. Regarding health insurance and staff contributions, all three candidates believe that asking for concessions would be reasonable, but it would have to be done through negotiations. Currently the district pays 100 percent of health insurance costs. Asked about class size, Blair said that smaller was better, but it couldn�t always be that way. Flynn, commenting about secondary school size, felt that 24-25 students was perfect, but saw nothing wrong with 27-28, as long as lower achieving students received assistance. Little felt that the lower the grade, the lower the class size should be. In response to a question regarding attendance at school board meetings, Blair and Little said that they had done so. Flynn had not, due, he said, to other commitments. In a discussion of tenure Blair thought that a renewable five-year tenure program might be a good idea, although she would not want to see higher-paid teachers let go so that lower-paid faculty could be hired. Flynn was not in favor of such a plan because districts could lose experienced teachers, and Little, who felt it was something he would have to consider carefully, added that it was important to have a plan in place to hold teachers responsible. Asked what they would cut if it became necessary to do so, Little replied that he would decide based on state requirements, with such items as music, sports, kindergarten as examples of what is not mandated. Flynn emphasized that the core curriculum shouldn�t be hindered; therefore, music and art programs would need to be cut. Blair recalled that as a trustee she had had to agree to cut field trips, which led her to found the Grand Island Foundation as a way of raising money for such non-mandated activities. League of Women Voters representatives Lee Tetkowski and Dorothy Westhafer acted as moderator and timekeeper, respectively. PTA Council members Nancy Major and Vicki Harnden handled the questions, which were written on cards and delivered by runners Theresa Covetto, Kacey White and Jessie Sturniolo, all 9th graders. The program was coordinated by Fran Seaman, PTA Council president�elect, and Nancy Major. It was held in Connor Middle School Little Theater and recorded by AV technician Josh Cormier, assisted by Aaron Wilson, a junior, to be shown on Adelphia Cable at a date to be announced. The three candidates are vying for two positions, to be vacated by Lee Cohen and Sue Gill, who are not seeking re-election. The budget vote and election will be held from 10 a.m. to 9 p.m. Tuesday, May 17, 2005 in the high school gym. A "Meet the School Board Candidates Night" is being held from 6:30-9 p.m. Monday, May 2, 2005 in the Connor Middle School Little Theater. Moderator will be Lee Tetkowski from League of Women Voters. The League will also provide timekeeper, League member Dorothy Westhafer. The following will run for two, open trustee seats on the Board of Education: former board member Myrna F. Blair of East River Road, Bryan Flynn of Baseline Road and Richard J. Little, Jr. of Sandy Beach Road. Trustees Susan Gill and Lee Cohen, whose terms are ending, are not seeking re-election. The budget/trustee vote takes place from 10 a.m.-9 p.m. Tuesday, May 17, 2005 in the Grand Island High School gymnasium. The Grand Island High School PTSA will hold its next meeting at 6:30 p.m. Wednesday, April 20, 2005 in the high school library. Officer Chris Pyc will have a brief presentation at 6:30 p.m., followed by the regular PTSA meeting. All interested are invited to attend! Refreshments will be available. Grand Island High School PTSA will conduct its 21st annual Geranium Sale to benefit the PTSA scholarship program. All profits made from the sale will go directly towards student scholarships. Pre-sale orders are being taken until Friday, April 29 and will be ready for pick-up from 9 a.m. to 6 p.m. Friday, May 13 at the Sidway Bus Garage. Plants available this year include geraniums, hanging pots, patio tomato plants, asparagus fern, spike plants and vinca vine. Order forms and more information may be obtained by visiting www.k12.ginet.org. To order by phone or if you have any questions, contact Nadine Bakula, 773-1334. Orders may be sent into your school office addressed to: High School PTSA Geranium Sale. Grand Island High School PTSA will hold its next meeting 6:30 p.m. Wednesday, March 9, 2005 in the Grand Island High School Library. "We will be voting on the nominations for officers for the 2005-2006 school year," PTSA President Terry Endres said this week. After the meeting, Dr. Thomas Ramming, Superintendent for Grand Island Schools, will have a presentation regarding Grand Island School District and its budget. The Grand Island High School PTSA meeting, scheduled for January 19th was cancelled due to weather. The next GIHS PTSA meeting has been scheduled for Monday, January 31st at 6:30 p.m. in the high school library. Members are needed to attend so new by-laws may be voted on. Memberships are still for sale at $5.00 each. Grand Island High School PTSA will hold its next meeting at 6:30 p.m. Wednesday, January 19, 2005 in the High School Library. The membership will be voting on new by-laws. PTSA memberships will be on sale for $5.00. All are invited to attend! Grand Island School District PTA delegates attending the 108th Annual NYS PTA Convention Friday, November 5 through Sunday, November 7 at the Rochester Riverside Convention Center. Shown in the left photo are Grand Island PTA Delegates (front left) Kaegebein Delegate Carol Kraft, Huth Road Delegate Mary Kulak, Sidway PTA President Nancy Major and Huth Road PTA President Fran Seaman; (back) Kaegebein Delegate Robyn Aronica, Kaegebein Delegate Kim Kernin, PTA Council President Kim Schopp, Middle School Delegate Vicki Harnden, Middle School Delegate Amy Garten and Huth Road Delegate Marlene Britt. Grand Island High School PTSA will hold its next meeting on Wednesday, October 13th at 6:30 p.m. in the High School Library. Memberships will be on sale at $5.00 with a free Viking magnetic calendar. 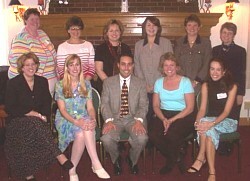 Grand Island School District PTA representatives met in the Buffalo Launch Club Wednesday, May 25, 2004 for dinner and the installation of officers for the 2004-2005 school year. PTA Council President and Schools Superintendent Dr. Thomas Ramming welcomed the group. Niagara Region PTA Director Jeri Bowden was the installing officer. Grand Island PTA Council Officers are (left) 1st Vice President Vicki Harnden, Treasurer Natalie Stancyzk, President Kim Schopp, and Corresponding Secretary Heather Figler. 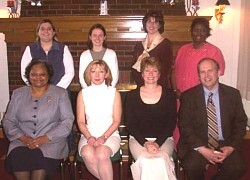 Missing from photo is Recording Secretary Patty Meyer. 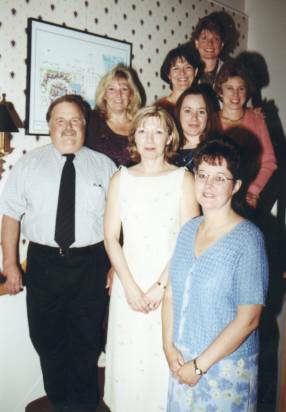 Grand Island High School PTA officers are (left) Principal Dr. James Dempsey, President Terry Endres, Vice Principal Jim Miller; (top) Treasurer Sandy Toth, 1st Vice President Maureen Lewis, Council Delegate Nadine Bakula, Corresponding Secretary Lauren Campbell, and Recording Secretary Sue Campbell. Missing from the photo are Council Delegate Patty Meyer and 2nd Vice President Shelia Richards. Huth Road School PTA officers are: (seated) Corresponding Secretary Susan Pino, Recording Secretary Julie DeRubes, President Fran Seaman, Principal Mary Haggerty, 1st Vice PResident Mary Kulak, Council Delegate Nancy Bolles, Treasurer Cindy Kaiser, Council Delegate Barb Swagler, Council Delegate Natalie Stancyzk, 2nd Vice President Donna Yaeger and Diane Lipp. Connor Middle School PTA officers are (left) 2nd Vice President Mary Jane Fonte, President Donnette Rayhill, Corresponding Secretary Karen Fischer, Treasurer Kati Posch, 1st Vice President Kathy Chadwick, Council Delegate Vicki Harnden, and 2nd Vice President Amy Garten. 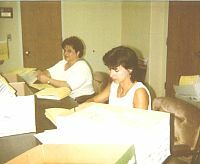 Officers missing from the photo are 1st Vice President Mary Howard, Recording Secretary Maria Shory and Council Delegate Weltha Rutland. 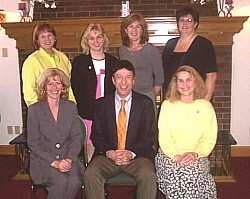 Sidway School PTA Officers are (front left) President Nancy Major, Principal Frank Cannata, 1st Vice President Ann Giancola, Council Delegate Kim Schopp; (top) Recording Secretary Trish Eichel (seated), Corresponding Secretary Tracy Myers, Treasurer Tracy Kozlowski, Council Delegate Barb Swagler, and 2nd Vice Presidents Bernice Schoener and Maura Rustowicz (seated). 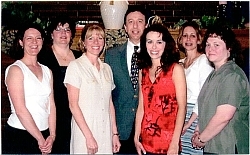 Kaegebein School PTA officers are: (seated left) Kati Posch, President Lisa Missert, Principal John Wiertel, Deanna Shoenberg, Kim Schopp; (top) Patty Shaw, Heather Figler, Vicki Harnden, Kim Kernin, Amy Nicolia. 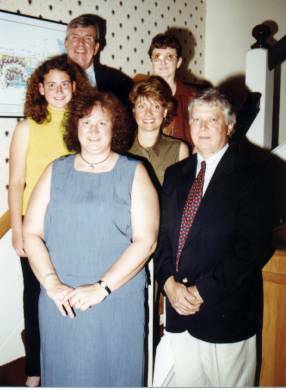 Recipients of the PTA Distinguished Service Award for 2004 are Maureen Lewis (Connor Middle School), Sue Campbell (Connor Middle School), Sidway Principal Frank Cannata (Sidway) and Vicki Harnden (Kaegebein). The award is given to those individuals who have already won the Lifetime Achievement and who go beyond with their efforts and dedication to children and bettering their education and welfare. The Grand Island High School PTSA will conduct its 21st annual Geranium Sale from 9 a.m. to 6 p.m. on Friday, May 14, 2004 at the bus garage behind Sidway School. About 50 people attended the Monday, May 3, 2004 Candidates Night that began promptly at 7 p.m. in the High School large cafeteria. Moderator for the event sponsored by the PTA Council and Chamber of Commerce was Mrs. Jeri Bowden, Niagara District PTA president. The candidates for the School District trustee seats are Mike Dallessandro, George Casey, James Milne, and incumbents Myrna Blair and Jeri Schopp. The election will fill two (2) three-year terms and one (1) two-year term. Candidates with the highest number of votes will receive three-year terms. Candidate with the third highest votes will take the vacant seat, which expires June 30, 2004. All candidates are relatively longtime Island residents whose children and grandchildren have attended Island schools. The first candidate to give his 3-5 minute opening speech was George Casey, a self employed accountant. His reasons for running are: "to continue and to expand opportunities to serve the youth of Grand Island through education, extra activities and community service projects." James Milne is a retired Town Assessor with 16 years experience with the Town of Grand Island and has worked closely with the school district on assessments and taxes. Mr. Milne gives the following as reasons for running for school board trustee: "I offer a broad financial background that will help in charting the course of school board policy. With changes in state aid and the uncertain economy, the board must plan carefully in order to avoid pitfalls which can bind it financially in coming years." Mike Dallessandro, is director of transportation at Lake Shore Central School District and oversees 100 employees and operation of the district's school buses. As reasons for running, Dallessandro believes that his background in school support services, safety and employee relations will complement the school board make-up. Myrna F. Blair, an accountant, former math teacher and founder of the Grand Island Foundation, has been a school board trustee for eight years. She lists reasons for seeking re-election as being able to continue to help set policy, to ensure that Grand Island students will be known for their academic achievement as well as their musical and athletic abilities. 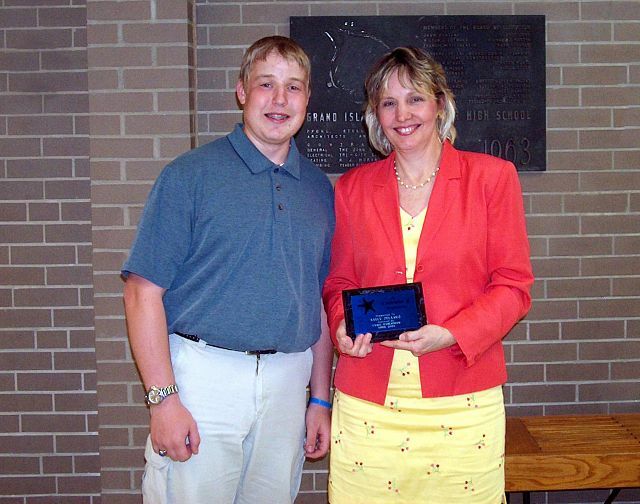 Jeri L. Schopp, first elected to the board of education in 1989, was last to speak. Mrs. Schopp, who forwarded her written speech to Isledegrande.com, said that during her 15 years on the school board, the district steadily improved its academic program. "It�s a much better school district now than it was when I was first elected to the Board. We have successfully completed major improvements and additions to the school physical plant, and over these years we have moderated tax increases for members of our community," she said. "If I am elected to the school board, I will do everything in my power to cooperate with the town to help the Town Council attract new, tax-generating businesses," she said. Over 50 questions were submitted to the candidates with the majority directed to the entire slate. The school district election will be held from 10 a.m. to 9 p.m. Tuesday, May 18, 2004 in the High School Gym, 1100 Ransom Road. A "Meet the Candidates Night" from 7-10 p.m. Monday, May 3, 2004 in the High School large cafeteria is being sponsored by the Grand Island Chamber of Commerce and co-sponsored by the Grand Island PTA Council. Those seeking re-election as school district trustees are Myrna Blair and Jeri Schopp. Other candidates running for the two (2) three-year terms and one (1) two-year term are Mike Dallessandro, George Casey and James Milne. The community is urged to attend to learn more about the candidates, and be informed when going to the poles on May 18th. The next meeting of the Grand Island High School PTSA will be held 6:30 p.m. Wednesday, April 28, 2004 in the Grand Island High School Library. Members are asked to RSVP whether they will be attending the upcoming Officers Installation Dinner. A Grand Island High School PTSA meeting will be held 6:30 p.m. Wednesday, March 10, 2004 in the Grand Island High School Library. The nominating committee will present its slate of officers for the 2004-05 school year for election. After the business meeting, Mr. Grosso (math teacher) will speak about the math program and any changes that have occurred. A Grand Island High School PTSA meeting, previously scheduled for Jan. 28, has been rescheduled for 6:30 p.m. Thursday, February 12, 2004 in the Grand Island High School Library. After the meeting, those attending will tour the newly completed music wing. PTSA memberships will be on sale for $5. Refreshments will be available. A Grand Island High School PTSA meeting will be held 6:30 p.m. Wednesday, January 28, 2004 in the high school cafeteria. Following the meeting, those in attendance will tour the new music department. PTSA memberships at $5 will be sold at the meeting. All parents and students are invited to attend! Grand Island, NY is fortunate to have a working SafeHomes Program in progress, thanks to the Grand Island PTA Council. Community-wide enthusiasm is high, according to Council President Kim Schopp-Baldassare, and support for the program has come from GIFTS coordinator Sue Novits, the Connections board, and the school district. The SafeHomes Program offers an opportunity for parents to join together to help provide a safer environment for their children. It does not require a commitment of time or extra effort for already busy families. "It is simply a public agreement between us to follow some simple principles that will provide a genuinely safer world for our children to grow in," Ms. Schopp-Baldassare said. As of December 2003, 182 Grand Island families have pledged their support to SafeHomes by signing up. These families are parents of children from all five Grand Island schools. Those interested in making their household and the community a safer place, are invited to join the already committed families to make this happen. "To learn more about the program, visit www.gisafehomes.com and print out a SafeHomes form, or feel free to contact the SafeHomes Committee from your school," Ms. Schopp-Baldassare said this week. A Grand Island SafeHomes representative will be in attendance at a community forum focusing on underage substance abuse. The forum, sponsored by the Connections board, will be held 7 p.m. Tuesday, January 13, 2004 at the Grand Island Memorial Library community room. The public in invited. 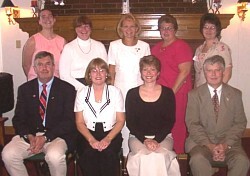 Grand Island School District PTA representatives met in the Buffalo Launch Club Wednesday, May 21, 2003 for dinner and the installation of officers for the 2003-2004 school year. Kaegebein Elementary School PTA Officers are (left) 1st Vice President Lisa Missert, 2nd Vice President Vicki Harnden, President Kathy DeMarco, Principal John Wiertel, Council Delegate Kim Baldassare, Corresponding Secretary Amy Nicolia, and Recording Secretary Kim Kernin. Missing from the photo is Council Delegate Nancy Mole. Veronica E. Connor Middle School officers are (left) Council Delegate Tracy Kozlowski, 1st Vice President Maureen Lewis, President Donnette Rayhill, Principal Bruce Benson, 1st Vice President Sarah Bifara, Corresponding Secretary Karen Fischer, Recording Secretary Maria Schory, 2nd Vice President Eloise Booker, and Treasurer Kathy Posch. Not pictured is Council Delegate Weltha Rutland and 2nd Vice President Tanya Weidner. 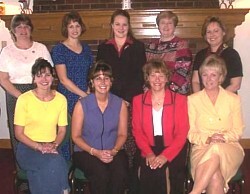 Charlotte Sidway School officers are (left) Recording Secretary Trish Eichel, Council Delegate Terri Pitts, Council Delegate Molly Dengos, 1st Vice President Ann Giancola, First Grade Representative Maureen Littlefield, President Nancy Major, Corresponding Secretary Tracy Meyers, 2nd Vice President Kathy Belter, Treasurer Bev Colautto and Kindergarten Representative Barbara Goldman. Not pictured is Principal Frank Cannata. Grand Island High School PTA officers are (left) Assistant Principal William Miller, 1st Vice President Terry Endres, Council Delegate Nadine Bakula, Council Delegate Patty Meyer, Recording Secretary Sue Campbell, Corresponding Secretary Lauren Campbell, Principal Dr. James Dempsey, Sheila Richards. Huth Road Elementary School PTA officers are (left) Corresponding Secretary Susan Pino, Council Delegate Nancy Bolles, Recording Secretary Lisa Gallagher, Principal Mary Haggerty, President Fran Seaman, 1st Vice President Barbara Swaglar and Council Delegate Cindy Kaiser. Not pictured are 1st Vice President Mary Kulak, 2nd Vice Presidents Jill Koelemeyer and Donna Yaeger. PTA Council officers (left) Vice President Tracey Kozlowski, Corresponding Secretary Terri Pitts, President Kim Baldassare, Recording Secretary Patty Meyer and Treasurer Cindy Kaiser. Sidway PTA Newsletter Editor Bethany Bernatovicz receiving award. The Niagara Region PTA held its 83rd annual spring conference at the Grand Island High School and Veronica Connor Middle School Thursday, May 8, 2003. Representatives from all of the 41 PTA Units in school districts throughout the Niagara Region PTA were in attendance. Opening the program, themed "Protecting Children - Empowering Parents," were Niagara Region Director Dolores Mitchell, Grand Island Superintendent Dr. Thomas Ramming, Grand Island High School Principal Dr. James Dempsey and Connor Middle School Principal Bruce Benson. Grand Island Council President Sue Campbell gave the Inspirational Moment preceding a buffet dinner. The meeting was called to order and Presentation of Colors was giving by Matt Masse, Andrew Ginsburg and Zachary Adams of Boy Scout Troop 510. Music instructor Debra Remson provided entertainment by the cast of the Connor Middle School's production of "Annie Jr."
This year's winning PTA Newsletter Award went to Sidway Elementary School. This is the 3rd consecutive year that the Sidway PTA has placed in the Newsletter Competition. Local arrangements for the conference were made by Sheila Richards and Lee Cohen. With another school year under way, students of all ages as well as school and youth organizations are actively involved in various fundraising efforts, be they candy sales, raffles, magazine sales, etc. The Grand Island Teachers Association (PTA) in announcing its support for the countless fundraising endeavors put forth by students of the Grand Island schools and various youth and sports organizations, also has some words of advice for Island residents, parents and students on safeguarding oneself from unscrupulous fundraisers. Residents are reminded that if they do not recognize the individual or school involved in the fund-raising activity that it is okay to inquire who they are before making a contribution. Feel free to ask his or her name and what organization is being represented. Students and/or youth groups are often instructed before hand to furnish this information as part of their collection efforts and usually would have no problem with the reasonable request of a resident. It is also recommended not to pay with cash when making a purchase or contribution - particularly if you have no record of the transaction. While soliciting organizations are usually happy to provide receipts of records of the transaction, that is not always the case. For your own protection and peace of mind, it's advisable to write a check payable to the organization. It also proves a safer method for both the resident and the youth carrier. The Grand Island PTA wishes its best to student fundraisers for the coming year and thanks residents for their continuing generosity. It's school-calendar time again, and these youngsters and their PTA moms are putting labels on the calendars, preparatory to mailing them out to the more than 2000 families with school children. The calendar has been a joint PTA Council/school district project for more than 20 years. Included in the calendar is information about the school district, as well as data about the town, the town recreation program, the town library, the Grand Island Foundation, GIFTS and PTA and school events. Superintendent Paul Fields was presented a National PTA Honorary Life Membership Award by PTA Council at the annual PTA installation recently. The award was given in honor of his outstanding efforts on behalf of students and his extraordinary contributions to student welfare and success. 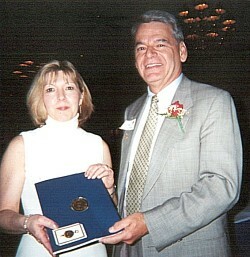 He is pictured with Sue Campbell, PTA Council president. 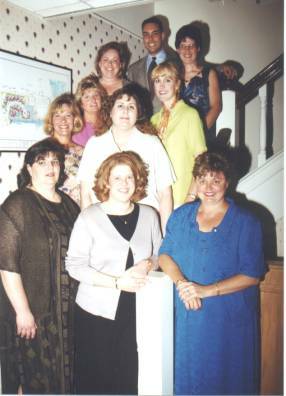 Grand Island School District PTA representatives met in the Buffalo Launch Club Wednesday, May 22, 2002 for dinner and the installation of officers for the 2002-2003 school year. Kaegebein Elementary School PTA Officers are President Kathy DeMarco, Vice President Linda Zimmerman, Second Vice President Vicki Harnden, Recording Secretary Kathy Chadwick, Corresponding Secretary Cheryl LoTempio, Council Delegates Nadine Bakula and Nancy Mole. Not shown are 1st Vice President Mary Cooke, 2nd Vice President Cyndi Booker, and Treasurer Joanne Piccione. Veronica E. Connor Middle School officers are President Shelia Richards, First Vice President Sarah Bilaro, Second Vice Presidents Tanya Weidner and Eloises Booker, Corresponding Secretary Patti Meyer, Council Delegates Sue Campbell and Tracy Kozlowski. Not shown are 1st Vice President Maureen Lewis, Treasurer Peggy Clarke, and Recording Secretary Kathi Hanaka. Charlotte Sidway School officers are President Terri Pitts, Treasurer Bev Colautto, First Vice President Mary Howard, Second Vice President Kathy Belter, Recording Secretary Barb Swagler, Corresponding Secretary Amy McMann, Council Delegates Nancy Bolles and Kim Baldassarre, Kindergarten Teacher Representative Marie Hartz and First Grade Teacher Representative Marge Benevento. Grand Island High School PTA officers are Principal Dr. James Dempsey, Assistant Principal William Miller, First Vice President Terry Endres, Recording Secretary Patty Meyer, Second Vice President Kathie Tim, Corresponding Secretary Myndi Tim, Treasurer Carol Skelly and Committee Delegates Anne Fetzer and Michele Meaney. Not shown is Maureen Schumacher. Huth Road Elementary School PTA officers are First Vice Presidents Cindy Kaiser and Mary Ellen Manuszewski, Second Vice Presidents Jill Koelemeyer and Karen Sturniolo, Recording Secretary Lisa Gallagher, Corresponding Secretary Nancy Bolles, Treasurer Renee Kippley and Committee Delegate Nancy Major. Not shown are President Karen Fischer and Committee Delegate Fran Seaman. When the Celebration of Inspiration was planned 10 years ago, it was seen as a recognition of a teacher who has "inspired you, who believed in you when you did not, who encouraged you in your efforts when you were ready to give up, who showed you the light at the end of the tunnel, who taught you something you'll always take with you." Teachers who inspired continue to be recognized. Last month the Celebration of Inspiration honored 29 teachers, representing faculty districtwide. The program is open to all seniors, who are asked to submit the name of someone who has been a strong positive influence during their school years. Each student writes a brief speech about the honoree and why he or she was chosen. The program is now sponsored by PTA Council, which provides plaques engraved with the names of the student and the honoree, the date, and the starfish emblem, which are presented by the student to the honoree. Invitations to attend are sent to students and honorees and their families, PTA presidents, school board members, and principals. The welcoming speech is given by the high school principal, followed by remarks by the superintendent. Dr. Paul Fields, by tradition, also shows the inspirational "starfish" video by Joel Barker, which is the source of the program's starfish emblem. Students then give their speeches and present the plaques, with closing remarks by one of the building principals. A reception follows, at which a large plaque bearing individual plates for each student-honoree pair is displayed. Plaques from past programs are on permanent display in the mall. The program, developed 10 years ago by then PTSA president Marilyne Brandoni, together with Maureen Schumacher and Superintendent Paul Fields, is now supported by donations from all the PTAs. Principals James Dempsey, high school, gave the welcome and Peg Koppmann, Huth Rd., the closing remarks. Honorees were introduced by Maureen Schumacher, incoming PTSA president. This year's honorees (pictured above) and their student presenters are Martin Allen (Jolie Dahlstrom, Alexandra Heaney), John Arnone (Michelle DelZoppo, Jamie Holmes, Anthony Rossi), Sandra Beach (Kelly Brennan), Tracy Beatty (Allison Moulin), Betsy Biro (Jeannette Buscaglia), Mollie Bowers (Lynn Conschafter), Carrie Earnst (Scott McMichael), Clark Elliott (Joseph Martino), Kathy Fik (Allison Dinsmore), Bobbie Frisoni (Lauren Mergel), Daneen Gallagher (Shannon Freer, Julie Sturtz), Susan Kupiec (Stephanie Goris) Carolyn Lokken (Dawn Drozdowski), Tricia McDonald (Amy Forbes), Mike Murray (Laura Fik), Donald Pray (Kim Knab, Katie Neely), Debra Remson (Michelle Kalisz), Bill Riffel (Jen Breier), Kathy Scarafia (Dan Belue), Tony Smith (Stephanie Miller), Steven Steck (Neil Reddien), Dan Sweeney (Stephanie Weisnet), Mark Tollner (Ashley O'Brien), Mary Walter (Abby Seitz), Tim Williamson (Anna Quider), Cindy Wynne (Michelle Cammarano), and Linda Zimmerman (David Blonski). The Grand Island High School PTSA will conduct its 19th annual Geranium Sale with pre-sale orders being taken through Friday, May 3, 2002. Orders will be available for pick-up from 9 a.m. to 6 p.m. on Friday, May 17, 2002 at the bus garage behind Sidway School. To order by phone, contact Deb Bota, 775-1727 or Nancy Pioli at 773-9484. Orders may be sent to the school office, addressed to: High School PTSA Geranium Sale. Plants available include: 3 1/2" geraniums in red, pink, white, purple, or bi-color; 10" Ivy Geranium hanging pot in red, pink or purple; 10" Impatients hanging pot in red, pink, white or mixed; 10" Fuschia hanging pot in red & white, red & purple, or white & purple; 8" Patio Tomato plant medium size tomato (staked); 3 1/2" Asparagus fern; 3 1/2" Spike plant; and 3 1/2" Vinca vine. Due to the unpredictable nature of growing things, the nusrery does not guarantee exact shade of flower. Make checks payable to Grand Island High School PTSA. Grand Island High School PTSA Officers are (not in order) President Barb Sobol and First Vice President Allison Armosewicz (both missing from photo), Second Vice President Kathie Tim, Recording Secretary Patty Meyer, Corresponding Secretary Myndi Tim, Treasurer Bonnie Benko, Council Delegates Anne Fetzer and Michelle Meany (both missing from photo), Principal James Dempsey and Assistant Principal William Miller. Connor Middle School PTSA Officers are (not in order) President Lisa Missert, First Vice Presidents Debbie McCoy and Nicole Oursler, Second Vice Presidents Michelle Meaney and Lisa Amsdill, Recording Secretary Kathi Hanaka, Corresponding Secretary Patty Meyer, Treasurer Peggy Clarke, Council Delegates Doug Marien and Sue Campbell. Principal is Bruce Benson. Huth Road PTA Officers are (not in order) President Karen Fischer, First Vice Presidents Maureen Lewis and Cindy Kaiser, Second Vice Presidents Deanna Cannavo and Karen Sturniolo (Karen missing from photo), Recording Secretary Meg Dolan, Corresponding Secretary Jean Greinent, Treasurer Renee Kippley, and Council Delegates Tracy Kozlowski and Fran Seaman. Principal is Peggy Koppman. The Officers of the Kaegebein Elementary School PTA Officers are (not in order) President Donnette Rayhill, First Vice Presidents Mary Cooke and Linda Zimmerman, Second Vice Presidents Andrea LaVere (missing from photo) and Cyndi Booker, Recording Secretary Kathy Chadwick, Corresponding Secretary Cheryl LoTempio, Treasurer Donna Tomkins and Council Delegates Terry Endres and Lori Sobieski. John Wiertel is principal. Sidway School PTA Officers are (not in order) President Terri Pitts, First Vice President Mary Howard, Second Vice President Amy Garten, Recording Secretary Mary Ellen Manuszewski, Corresponding SEcretary Amy McMann, Treasurer Vicki Harnden, Council Delegates Nancy Bolles and Meg Dolan. Teacher Representatives are: Kindergarden, Amy Stevenson; 1st grade, Pam Suscyczynski. The Grand Island Teachers Association has conducted a flower sale to raise funds for Hospice and will provide flowers for resident's rooms and the dining room tables RiverWood Health Care Center. 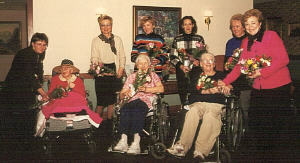 After delivering the bouquets at the schools, the committee of Linda Harbison and Debbie Beis and their assistants, Kathy Fik, Mary Domanski and Lorraine Szezublewski arrived at the Riverwood with boxes of bouquets which had to be arranged and put in vases for distribution throughout the Center. Marlowe Beis, also on the committee, was not available for this delivery. You are invited to the Niagara District PTA's free annual Exhibitors Fundraising/Program Showcase on Wednesday, March 21 from 3:30-7 p.m. The showcase will be held at Skateland Family and Fun Center, 1109 Lincoln Ave., Lockport (off Transit Rd.). This showcase is open to all public and private schools and community fundraising organizations. Sample exhibits, receive free material and register for door prizes. This is your chance to see what the exhibitors have to offer this year for your organization or school. "Parents + Teachers = Achievements for Children and Youth" was the theme of the 104th annual convention of the New York State PTA, held in Buffalo earlier this month. More than 1000 delegates, including 17 from Grand Island, attended workshops, adopted resolutions and helped set priorities for the coming year. Keynote addresses were delivered by Jacquie Walker, news anchor for WIVB-TV channel 4, Vicki Rafel, National PTA vice president for legislation, and Roseanne DeFabio, assistant commissioner for curriculum, instruction and assessment of the State Education Department. Also at the convention was an extensive display of student artwork from this year's state Reflections program with award-winning works in the areas of visual arts, photography, music and literature. The convention's theme challenged delegates to return home and become stronger advocates for all children and for public education, reaffirming PTA's goal of improving the lives of all children and youth. Two Islanders, Terri Endres and Sheila Richards, were among six Niagara District delegates singled out at the convention to be honored with Golden Circle of Leadership awards for their participation in PTA. 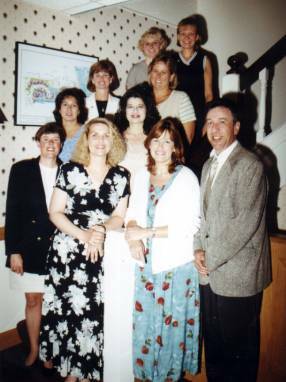 Attending from Grand Island were Bonnie Benko and Barb Sobol, representing the high school; Sheila Lazeration, Doug Marien, Lisa Missert, Sheila Richards, from Connor Middle School; Amy Garten and Vicki Harnden, Sidway; Nadine Bakula, Mike Dollard, Terri Endres, Donnette Rayhill, Jody Slipko, Lori Sopieski, Kaegebein, and Lee Cohen and Mark Lazeration, from Niagara District PTA. Huth Rd. School was not represented. Next year's convention will also be held in Buffalo.